I have been confused for the last few days because I’ve almost had my hair parted by a swallow that has rapidly vacated the hen house each morning as I open their front door. What’s confusing about that, you might think, well the thing is, there isn’t a nest in there and the swallow just roosts there overnight on his own. 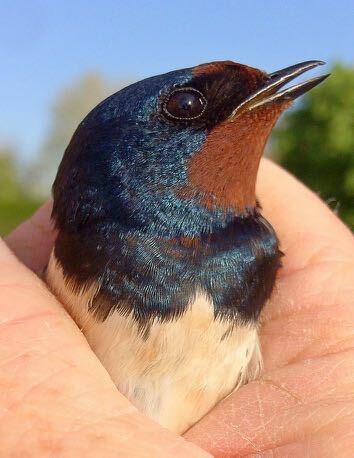 I was surprised the other day when I first saw him in there and what was unusual, for me, is that I had never seen a swallow on their own for any length of time. So, why is he in there? Has he lost his mate? Is he en route to somewhere north of here and is just having a rest? Is he giving his other half some peace? Or is he just a loner? Whatever the reason, it has really got me wondering and I do feel sorry for the little fella, with him being on his own trying to snuggle down to get some kip with all those fussy hens doing their best to keep him awake. Mr Swallow unfortunately wasn’t the only loner I came across this week. I was just walking back around the house, after putting up our lovely new sparkly white washing line, when there was a sudden torrential downpour. The shower lasted all of about four minutes, but as I got back around to the front of the house, I happened to look up and noticed that there was something stuck to the wall, up under the eaves. I quickly moved my glasses off my head to where they would be more useful, so I could take a closer look and instantly recognised that what was hanging onto the wall for dear life was a bat. I stood gazing up at him or her, but almost immediately, as soon as the rain had stopped coming down, the little bat leapt off the wall and continued on their way. It is surprising what you learn out here, because I never realised that bats didn’t like the rain, or maybe it was a ‘she’ and she had just had her hair done and didn’t want it ruining. I suppose I will never know. From time to time there are sounds that carry across the farm clearer than many others and one such noise is the sound of a lamb bleating. I had been busying away with some domestics at the time and so was all the way across in the house, when I once again heard the sound of a bleating lamb. On this occasion it was different to most others and went on for a time, so I went off in search of the noise to investigate. As I walked through the farmyard the sound got louder and louder, and so it was not long before I reached the source of such a racket. What I found was that ‘Flash’s’ little white lamb had decided to do some exploring. Now, because I had opened up part of ‘The Green Mile’ for the sheep to graze, there were all sorts of new and exciting things for the lambs discover, but this little fella had found himself getting stuck, where he shouldn’t have been. Our unfortunate lamb had somehow squeezed between two lines of fencing and had headed down what was in effect like a tunnel, which narrowed as it went along, like Alice experienced in Wonderland, until it came to an end and it was here that he was quite truly stuck. Reversing back the way he came apparently wasn’t an option for him and so I had to unceremoniously lift him out backwards by his back ankles. I have a feeling that the little mite won’t be doing that again anytime soon.